The worker-owners of Red Rabbit Bakery were directly inspired by the Michael Moore documentary Capitalism: A Love Story, back in June 2010. After an initial planning period, which included completing Cooperation Texas’ business start-up course, this cooperative bakery opened for production in May of 2011, and has grown by leaps and bounds ever since. Today the bakery employs ten people, manages twenty-five wholesale accounts, sells at local farmers’ markets, and in just three and a half years has more than quintupled its annual sales. Its next move is to open a coffee shop and café after successfully operating a food truck in the same neighborhood for the last year and a half. 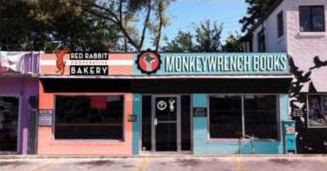 The new coffee shop and café is a partnership with Monkeywrench Books in Austin, and demonstrates Cooperation among Cooperatives, the sixth principle of cooperation (Principle 6). Monkeywrench Books is a volunteer-run radical bookstore and community space collective. By sharing space, the two small cooperatives are able to lower their overhead expenses and share a common customer base. Red Rabbit will also be partnering with Equal Exchange cooperative to offer fair trade espresso and coffee drinks to go along with their own sweet and savory baked goods. Principle 6 doesn’t end there. Since its inception, Red Rabbit has had a great partner in the Wheatsville Food Co-op, which has been an enthusiastic customer since the very beginning. Dana Tomlin, fresh manager at Wheatsville said, “Our customers were asking for different flavors of donuts and Red Rabbit created a rotation of new and exciting flavors that were affordable and fun.” Red Rabbit’s offerings are featured in both of the food co-op’s locations. Further, Wheatsville Food Co-op, and Austin-based housing cooperative, College Houses, both offered financial support for Red Rabbit by guaranteeing a portion of NCDF’s first loan. The co-ops in Austin, Texas have clearly demonstrated how cooperatives from many sectors can support each other and grow the local cooperative economy. “Austin is a big, competitive city and we work together to help grow the co-op economy,” Tomlin said.